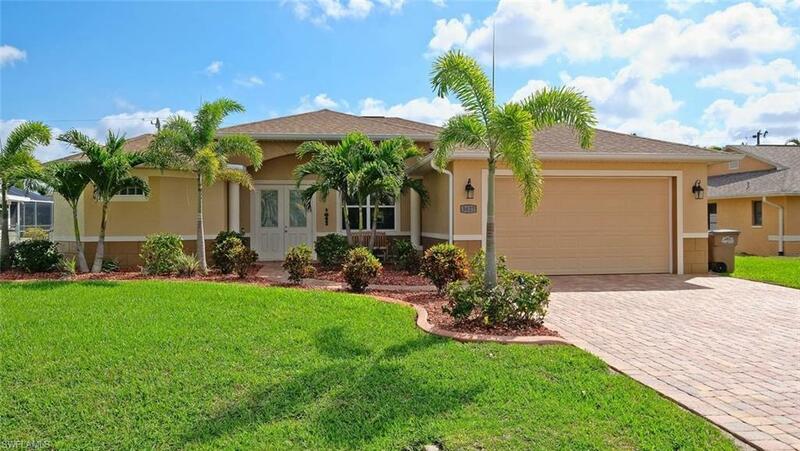 Exclusive custom home in the heart of SW Cape Coral Built in 2014 , This spacious 3 bedroom, 2 bath, Pool Home with 1874 sq ft of living is everything you could imagine. This custom pool home has an amazing layout offering plenty of space for the entire family – Huge Great room, Outdoor Living, and wonderful kitchen with upgraded cabinets, granite counter tops and high end stainless steel appliances. All bathrooms are completed with the newest and most up to date finishes! Home features tile floors throughout the main living area and Wood Floor in the Master bed, Oversize Paver Driveway and Pool Deck, Electric Heated Pool, Master Bedroom Has a Huge Walk in Closet, Double Glass Front door and Loaded With Upgrades. Also enjoy your privacy, Home Completely Fenced in With Vinyl Fence and home security system with Ring Video Doorbell! The home has a fantastic landscape package that is mature and fully developed! This owner has kept this home in pristine condition from the day they finished building it! Check out the virtual tour link !!!!! ASSESSMENTS PAID !!!!!! NO FLOOD INSURANCE !!!! Selling Office: Premier Cape Realty Inc.